Garlic is one of the oldest cultivated plants in the world, and one of the most valued and commonly used spices. While it may be known for its pungent smell and distinct flavor, capable of transforming any dish, garlic is also loaded with immense health benefits. It's antibacterial and anti-fungal, not to mention full of healing properties thanks to the presence of allicin, a sulphur-bearing compound with medicinal qualities. If you want your meals to be aromatic and healthy, garlic is the way to go. Not convinced? Here are five reasons to add a clove or two to every dish. Studies show a link between eating garlic and a lower risk of certain types of cancer. The presence of allyl sulfur compounds in garlic can disrupt the division required for cancerous cells and prevent the growth of tumors in the body. This wonder herb can reduce the risk of cancers of the stomach, colon, pancreas, breast and esophagus, making it one of best ingredients for anti-cancer properties to incorporate into your daily diet. It can also help combat the side effects of chemotherapy and speed up recovery in cancer patients. Garlic contains a number of compounds that can provide instant relief from asthma symptoms. It contains vitamin C and allicin that neutralize the free radicals that cause a contraction of the airway in people suffering from asthma. 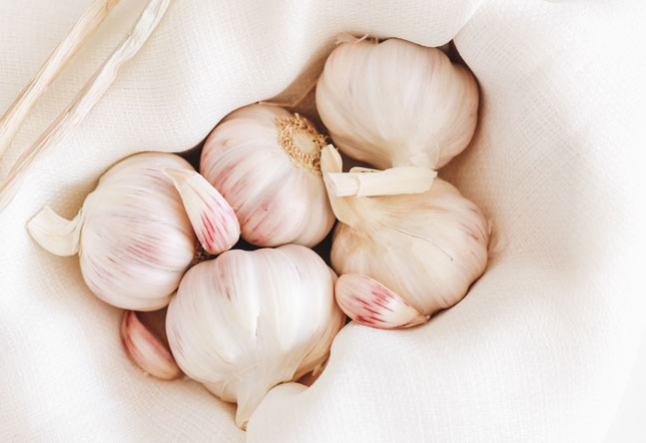 Garlic can also boost the body’s ability to produce prostacyclins, the lipid molecules that keep the air passages open and promote easy breathing in asthma patients. Garlic plays an important role in regulating allergic reactions caused by the release of histamine. Try it and see for yourself. Garlic can improve the immune system as well as strengthen it. Garlic has strong antiviral properties that can treat infections. It acts as a natural antibiotic and can eliminate harmful bacteria. Studies have shown that people who include garlic in their diet have significantly fewer illnesses like common colds, and that, even if they do get sick, the duration of their cold is shortened compared to those who don't eat garlic. Bottom line? Garlic protects the body and keeps it healthy. High blood pressure (also known as hypertension) can lead to cardiovascular disease and is one of the major causes of heart attacks and strokes. Studies have shown that supplementing your diet with garlic has a significant impact on reducing blood pressure in people suffering from this ailment. Garlic can also reduce the effects of hypertension. Win-win. Studies have shown that garlic can act as both a preventive and treatment agent for many metabolic and cardiovascular diseases. Research found that the consumption of garlic had significant cardio protective effects. It has an impact on many diseases like hyperlipidemia, thrombosis, hypertension and diabetes. One of the most astonishing benefits of garlic is that it can reverse early heart disease by simply reversing plaque build-up in the arteries, the main source of budding heart disease. Yet another reason to love this stinky herb. Now that you're aware of all the wonders garlic can do for your health, it's time to figure out how to add it into your diet. Adding garlic to your diet is not that difficult, and even small amounts of it can have a big impact. Garlic is most effective when eaten fresh and raw, however, some people find it quite strong, so you may want to lightly cook it before adding it to your dishes. You can add it in many forms: cut it into small pieces, make a paste/powder. You can also chop a clove into small pill-sized shapes, mix them with warm water and drink up. Gradually you'll start noticing the effects on your body, and an improvement in your overall health. One word of warning: too much garlic can cause an upset stomach, so start small and slowly work your way up. Add this wonder herb to your kitchen repertoire and reap its health benefits for a fit and happy life.